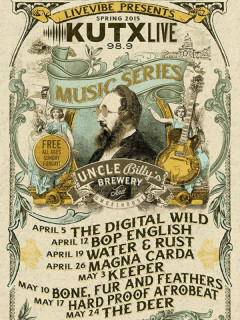 KUTX presents a spring version of the free music series at Uncle Billy's on Barton Springs every Sunday. Enjoy DJ sets starting at 2 p.m., followed by live performances at 4 p.m. from some of Texas' hottest touring bands. VIP tables for four are available for $50. The schedule is below, but is subject to change. Check in with the KUTX website for more information.